Almost opposite the painter/chemist Hartog Goldsteen, lived  at the beginning of the War  in the upstairs flat of the 2nd Hoofdstraat 32a four unmarried Goldsteens: Mozes, Saartje, Betje and Samuel. Mozes (born on the 27th of November 1867), Saartje ( born 10th of May 1870), and Betje (12th of October 1872) were three of the eight children of Samuel Goldsteen and Jansje Cohen. Apart from these three, another daughter lived in Meppel: Bilha, married to Levi van de Rhoer. Samuel (Sampie) Goldsteen was a cousin of theirs and the son of Israel Goldsteen and Naatje Zeehandelaar. 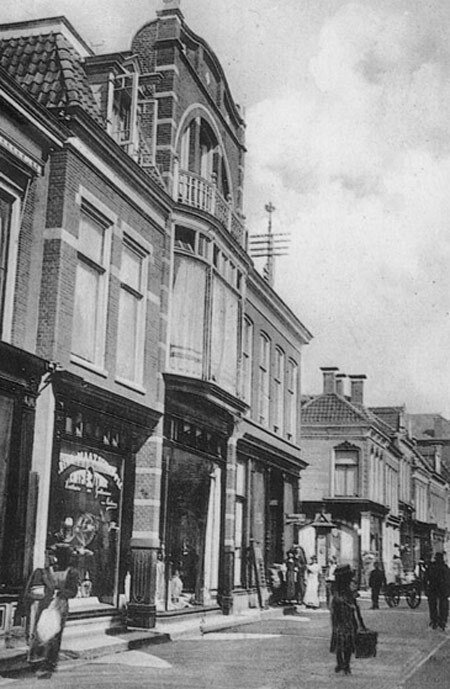 Mozes lived from the 17th of August 1874 to the 30th of June 1884 in Groningen, but later he returned to Meppel. First he lived on Emmastraat number 50, later he moved to the Hoofdstraat. He was a tailor by trade. While cycling home from work at Balkbrug, on the evening of the 24th of September 1941 around eight-thirty, he had a heart attack and died in front of café Pol on the Ezingerweg. Luckily, the Meppeler Courant still appeared at that time and Sampie and his sister could say farewell in an announcement. A year earlier, shortly before the War began, sister Saartje had died on the 13th of June 1940. It was Benjamin Kroon, the verger of the Synagogue, who registered her death on the 14th of June, also stating the accurate time of death: a quarter to eight. 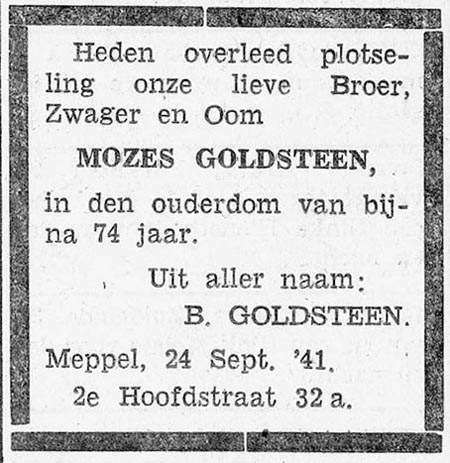 The announcement of the death of Mozes Goldsteen, who lived together with Samuel. As Sampie had suffered from infantile paralysis and therefore his walking was infirm, he had not become a painter (according to Goldsteen family tradition), but the owner of the kiosk in Kerkplein. Weather permitting, he would sit at the entrance of the kiosk on his stool. He was not quick, but compensated this with a big dose of cleverness. Quite often he would have quarrels with youngsters. If a boy teased him, and escaped unpunished, he would remember it for months and at a given moment, he would say to the boy concerned: ‘do you want a sweet?’ The boy had long forgotten the incident and went into the kiosk, where no sweets were waiting for him, but a few strokes with a stick. Sampie was also witty. One day the cigar shop keeper Pouwels invited him to a poetry competition. Pouwels began with: ‘Sampie gets a crampy’ and Goldsteen replied with ‘Pouwels gets the plague.’ When Pouwels shook his head and said ‘you can’t call this a rhyme,’ Sampie answered quickly ‘no, but you can still get the plague’. Because of his appearance Samuel was also nicknamed ‘Sampie with the bottom’. Everyday Sampie would stumble from his home to the kiosk and back. Because his legs were bad, it took some time to climb the stairs to his accommodation. Gretha Levie wearing the star of David on her coat in front of the kiosk of Samuel Goldsteen on Kerkplein. In the background, right from the kiosk, most probably the owner. The kiosk on Kerkplein was definitely closed on the 24th of January 1942, by order of Omnia. Already on the 26th of January the Germans took anything of value away. Mayor Wisman kept General Commissioner Wimmer well informed of the latest status of Sampie’s business. What happened to the Kiosk? Omnia sold it to Egbert Spiker, who then gave it in use (by some whim of fate) to the National Youth Organisation and the National Socialist Movement. There is still a letter, with the letterhead of the National Socialist Movement in the Netherlands, in which Spiker complains to the Council of Meppel concerning the delay of the repair of a broken window after vandals had thrown a stone through it. When all the Jews were picked up on the 3rd of October, they left Sampie alone. Only Betje was taken from the house. At first the Meppel Police had spared him, because he was not able to walk to the station. It was only a temporal postponement. 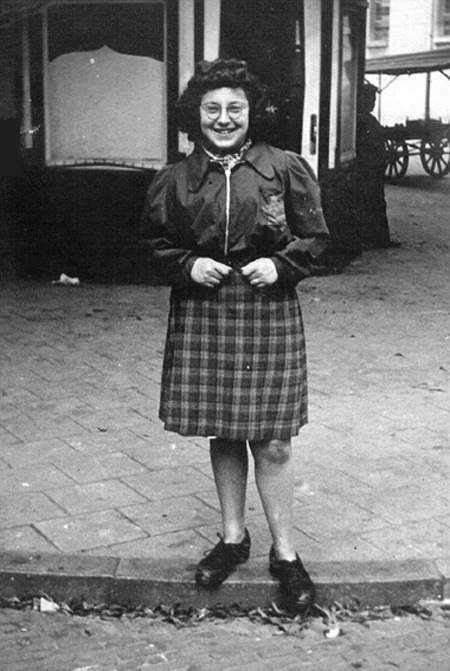 When on the 6th of October the remainder of the Jews were transported by bus to Westerbork, Sampie was amongst them! Rumour goes he pretended ignorance when the Police rang the doorbell  he was dragged from his house and thrown from the stairs by the Grüne Polizei (‘Green Police’) and put into the waiting truck. Both Betje and Samuel stayed two weeks in Westerbork, from where they were put on transport to Auschwitz the 22nd of October. On the 26th of October 1942 both their lives ended.